Hyssop is a beautiful sub-shrub with very showy deep blue flowers in summer, from July to September. These plants grow into compact bushy shrubs about 40cm high, and look great in borders, Mediterranean and herb gardens and as path edging. They also grow well in containers. Hyssop is an ancient culinary and medicinal herb. Fresh leaves can be harvested in spring and summer for cooking and the leaves and flowers can be dried and stored in summer for use over winter. 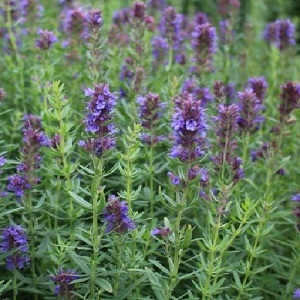 Hyssop grows well in sun and well drained neutral to alkaline soils. It is drought tolerant once established and attract lots of pollinators into the garden. Pack of approx 1000 seeds. Sow in spring to autumn in a tray of compost. Sow by March for first year flowers. Sowing instructions and a colour photo are printed on the packet. Sow Sow the seeds spring to autumn in a tray or small pots of moist seed compost. Cover lightly with compost, keep at 20°C and germination takes 1-2 weeks. Transplant seedlings into pots when they are large enough to handle and plant out into the garden when frost free. Sow by March for first year flowers. Keep summer/autumn sowings in a cold frame or greenhouse over winter, and plant out in the spring after hardening off. Grow Plants need very little care once established. These are semi-evergreen, and will shed some leaves in colder winters, growing again in the spring. Trim back the plants lightly after flowering, in the autumn. Softwood cuttings can be done in summer, from fresh new growth.